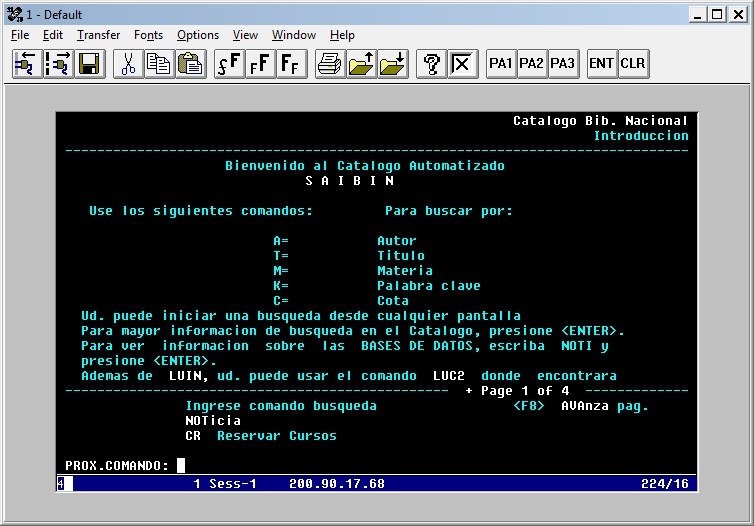 The National Library of Venezuela offers one of the most unique experiences in online library catalogs. To be able to check the catalog, you need to go first on a part of their website where you have the instructions on how to use it, only in spanish for now, but take my word on them. Now there’s no more mouse input for you, so you have to login and input commands using only the keyboard: you press “b”, then “Enter”, then “Tab”, you put in the username “OPERATOR” and password “OP3RAT0R” (pretty sneaky, huh? ), then “Enter”, “F10” and write in caps the word “LUIN” and… VOILA! By judamasmas in Research on 2010/02/27 . Hervorragender Post. Da hat mich Google erneut an einen hervorragenden Blog geschickt. You can depend me in for a Digg. Thanks for posting this on your web site! Hi – It’s great to find such topical writing on the Web as I have been able to fiind here. I agree with most of what is written here and I’ll be coming back to this site again. Thanks again for publishing such great reading material!! When I initially commented I clicked the -Notify me when new feedback are added- checkbox and now each time a remark is added I get four emails with the same comment. Is there any method you can remove me from that service? Thanks!